Saving the environment 662,682 pounds of CO2 per year. To earn ENERGY STAR certification, a home must meet strict guidelines for energy efficiency set by the U.S. Environmental Protection Agency. These homes are at least 20% more efficient than standard new homes built today. 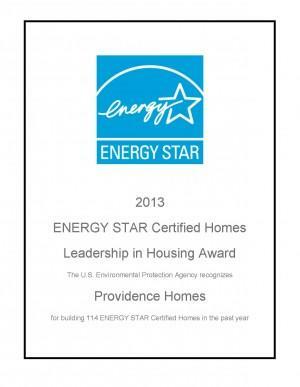 ENERGY STAR certified homes offer homebuyers all the features they want in a new home, plus energy-saving features like effective insulation systems, high performance windows, tight construction and ducts, properly-sized and installed efficient heating and cooling equipment, efficient products, and third-party verification of energy performance. “ENERGY STAR builder partners offer new homes that are designed and built to standards well above most others on the market today” said Jonathan Passe, Director of EPA’s ENERGY STAR Residential Branch. “Because ENERGY STAR certified homes undergo rigorous independent inspections and testing, homebuyers who choose ENERGY STAR can be confident that their new home will offer real energy efficiency, comfort, durability, and value for years to come.” Last year alone, with the help of ENERGY STAR and partners, Americans saved nearly $400 million on their utility bills and avoided greenhouse gas emissions equivalent to those of more than 510,000 vehicles. More than 1.3 million ENERGY STAR homes have been built in the United States since the program first began labeling homes in 1995. About Providence Homes Providence Homes has catapulted from a one-man, home-based operation in 1992 to becoming one of the top 10 builders in the Jacksonville area, and the second largest locally owned residential builder. Bill Cellar and his team of 25 professionals have put together the very best talent dedicated to creating the finest homes at an exceptional value. At Providence Homes, we believe that the most important element of your home is you. Our goal is to build every home with the same attention to detail and commitment to excellence as we would with our own family’s home. That is why we have spent the last 20 years building award-winning homes – one home at time. About ENERGY STAR ENERGY STAR was introduced by the U.S. Environmental Protection Agency in 1992 as a voluntary market-based partnership to reduce greenhouse gas emissions through increased energy efficiency. Today, ENERGY STAR offers businesses and consumers energy-efficient solutions to save energy, money and help protect the environment for future generations. More than 127,000 new homes were constructed to meet ENERGY STAR guidelines in 2011, by partners committed to improving the energy efficiency of products, homes, buildings and businesses. For more information about ENERGY STAR, visit www.energystar.gov or call toll-free 1-888-STAR-YES (1-888-782-7937).